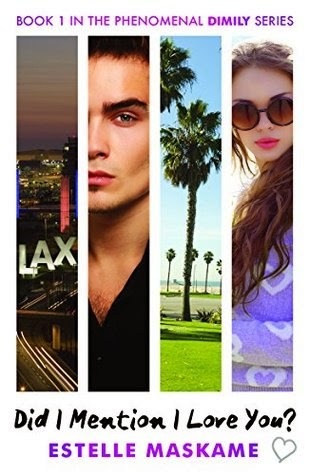 When sixteen-year-old Eden Munro agrees to spend the summer with her estranged father in the beachfront city of Santa Monica, California, she has no idea what she s letting herself in for. Eden's parents are divorced and have gone their separate ways, and now her father has a brand new family. For Eden, this means she's about to meet three new step-brothers. The eldest of the three is Tyler Bruce, a troubled teenager with a short temper and a huge ego. Complete polar opposites, Eden quickly finds herself thrust into a world full of new experiences as Tyler's group of friends take her under their wing. But the one thing she just can't understand is Tyler, and the more she presses to figure out the truth about him, the more she finds herself falling for the one person she shouldn't her step-brother. Throw in Tyler's clingy girlfriend and a guy who has his eyes set on Eden, and there's secrets, lies and a whole lot of drama. First of all, I have to say that Estelle Maskame is a unbelievable young writing talent- and from the first page, of 'Did I Mention I Love You,' I was completely enraptured and bewitched. The story follows Eden Monro, who has gone to Santa Monica to live with her father for the summer: who separated from her mother years before. Eden also has to share her summer with her stepmother, Ella; and her three stepbrothers. Tyler Bruce is the eldest, and his group of friends let Eden in their circle. But when Eden tries to uncover some secrets, and lots of people's feelings become involved: no one knows exactly how summer is going to pan out. I adored all of the characters, especially Eden- who is potentially relatable to lots of teenagers, and even Tyler, because I quite liked his mysterious, troubled personality. I definitely became attached to both of them throughout the book- cringing and smiling at some of the predicaments they managed to get themselves into. Maskame covers all of the characters in the book in different ways, so readers can get an large insight into their lives. I never knew what direction the plot was heading in, so some of the events really had me gasping, and I really didn't expect them to happen at all. I know people can easy overuse, 'I couldn't put it down,' when describing a book, but in this instance I really couldn't bring myself to put it down. It was so easy for me to tell myself to just read a few more pages, and before I would know it I had read three chapters. 'Did I Mention I Love You,' is a unquestionable 5/5: it's a lovely summer read, and I don't think I can wait to read the rest of the series! Q. What inspired you to write the 'Did I Mention I Love You,' series? A. I've always loved reading novels about teenagers who can't be together, but it's usually always due to the fact that one of them is popular in school and the other isn't, or that their parents hate each other; reasons that can actually be overcome quite easily. I liked the idea of "forbidden relationships" and wanted to do something different with it. I wanted to tell the story of two people who couldn't be together because of a more serious matter, and I thought about step-siblings falling in love. It's not illegal for step-siblings to marry yet society looks down on it, so I decided to write about a step-sibling relationship that's kept a secret out of the fear of being judged and unaccepted. Q. Have you always wanted to become an author? A. I've always loved writing but the idea of being an author never seemed like a realistic goal. It was always just a dream job, like how some people dream of being a singer or a professional football player, so I never looked at it as a possibility. Before the book deal came around, I was stressing out about what I wanted to do when I left school, so all of this happened at just the right time! I was lucky enough to be able to say that being an author wasn't just a dream anymore. Q. What have the experiences of being a young author been like? A. There's a lot of pressure, but at the same time it's also so exciting. While my friends are heading off to college and university, I'm doing interviews and photoshoots, so my life's really different to what it could have potentially been like. There's always something going on and sometimes I have to ask myself, "Is this even happening?" because it still feels surreal that I'm an author at this age. Q. Are any of the characters in the series based on yourself, your family or friends? A. None of the characters are based on anyone, but I did get some of their names from family and friends! A. I didn't particularly have any favourite subjects, but if I had to choose, then the business department was definitely my favourite. I studied three subjects within it - administration, business management and accounting - and found that I enjoyed these subjects more than any of the others I studied. Strangely enough, I absolutely hated English! Q. Do you have any plans for your future writing career? A. I'm definitely going to keep writing and see where all of this goes. No matter what, I think I'll always keep on writing, even if it returns to only being a hobby. Soon I'll be starting my next project! A. I really adore "Before I Fall" by Lauren Oliver, "Eleanor & Park" by Rainbow Rowell, and "Paper Towns" & "Looking For Alaska" by John Green. I love how honest they all are about teenagers, about what we're thinking and how we act and the way we interact with each other. I like the fact that some moments are messy and that the characters don't always do the right thing. I can only hope that my writing will have the same authentic feel as these books! Q. Do you have any advice for budding teenage authors? A. I think a lot of teenage writers feel that their writing isn't up to par or that they're not taken seriously because they're young. The most important thing when writing as a teenager is to keep on going, because at this age our writing is constantly changing and improving the most, so don't worry if your writing isn't yet up to the standard that you want it to be. I can't even look back at the stories I wrote when I was twelve without cringing, but at the same time I'm proud of them because without writing them I would never have improved. Always be proud of what you write! Teenagers have the ability to write novels as unique and interesting as a person in their thirties could, so never think of your age as a setback, and don't be afraid to get your work out there. I really do recommend posting online. It can seem terrifying to let strangers read your work, but on sites like Wattpad, people are never often negative. You'll always find people who love your work and you never know who could be noticing it - a lot of writers get discovered online, and you could be one of them. Q. If you could pick any book character to be your alter ego, who would it be? A. Definitely Margo Roth Spiegelman from "Paper Towns" by John Green! I love how strong-willed she is and that she doesn't want to just simply live an average "paper life". I like that she wants to be different by doing her own thing.